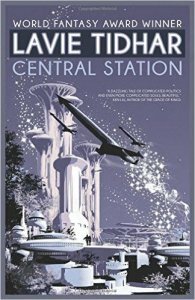 Central Station, Lavie Tidhar (Tachyon 978-1-61696-214-2, $15.95, 252pp, tp) May 2016. There are knowing references to other SF as well; in ‘‘Strigoi’’, the data-vampire protagonist is referred to as a ‘‘shambleau’’ in a nod to C.L. Moore, while the recurring figure of the robot priest R. Brother Patch-It invokes both Asimov and Simak, and, a bit more waggish, one of the competing churches in future Tel Aviv is the ‘‘Elronites.’’ Despite the manifest affection for older SF, Central Station is neither pastiche nor parody, and there are darker and more contemporary aspects to this future as well – cyborgized and alienated war veterans called robotniks; addiction to a vision-inducing drug called Crucifixation; ‘‘post-mortal options’’ including cryogenics, ‘‘translation’’ into the virtual matrix (here called the Conversation), or cyborgization; an emerging counter-society of Others, or self-aware AIs living in the virtuality. Almost everyone, from birth, has a ‘‘node’’ which connects them to the Conversation. Underlying it all is the vividly realized and historically complex setting of Tel Aviv, haunted by its long, conten­tious history, abiding Israeli-Palestinian tensions, and economic inequality with the district of Jaffa. At the same time that Tel Aviv-Jaffa is haunted by the history of our own era, it haunts the more distant future of the implied frame-tale. Most of the stories revolve around a couple of families, the Chongs and the Joneses. 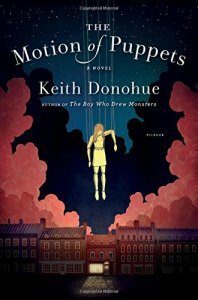 In the opening chapter, ‘‘The Indignity of Rain’’, local bar-owner Miriam Jones takes her adoptive son Kranki to the spaceport, where he again vainly hopes to meet his father returning from space. Instead they meet Boris Chong, the heir of a dy­nasty which dates back to the original construc­tion of Central Station itself. Later we’ll learn of Boris’s involvement with Carmel, the hunted ‘‘vampire’’ or ‘‘shambleau’’ who manages to get through Central Station security, and we’ll meet Miriam’s brother Achimwene, a book collector who, born without a node or connection to the Conversation, comes to value the older form of information storage in books. Another character we meet in the first story, Isobel Chow, makes her living in the virtuality as a captain in an online game called the Guilds of Ashkelon, and she herself gets engaged to a damaged robotnik veteran named Motl, who in turn leads us to other connections, and so on. Some of the characters, like the ‘‘god artist’’ Eliezer or the junk dealer Ibrahim (the ‘‘Lord of Discarded Things’’), seem to have their own legends, with hints that Ibrahim might be a kind of immortal figure dating back almost to our own era. 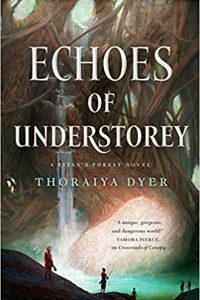 In good linked-story tradition, minor characters in one story become major characters in another, and the overall tapestry that emerges attains a persuasive unity, even if it’s not quite a novel. The stories include some of Tidhar’s most beautiful prose, and his future Tel Aviv is among the most evocative settings in recent SF, not least because Tidhar, rather wisely, refrains from expanding the point of view to, for example, the Martian colonies (readers interested in check­ing those out might want to read Tidhar’s Martian Sands). Somehow, Central Station combines a cultural sensibility too long invisible in SF with a sensibility which is nothing but classic SF, and the result is a rather elegant suite of tales.